If you are interested in working with data from space telescopes, you want to know about the Barbara A. Mikulski Archive for Space Telescopes. MAST, is operated by the Space Telescope Science Institute in Baltimore, Maryland. The STScI supports NASA's Hubble Space Telescope (HST), James Webb Space Telescope (JWST), Wide-Field Infrared Survey Telescope (WFIRST) and Kepler space telescopes. 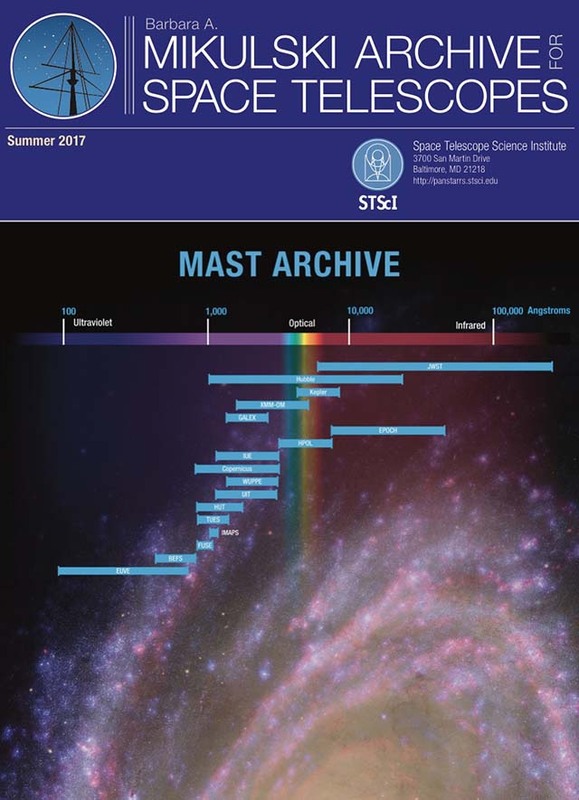 Over four dozen datasets from these and other space telescope missions are hosted in the MAST archive. Archives from the Pan-STARRS survey are soon to be included in the integrated retrieval interface. In addition to an easy to use unified interface to the imaging data, the archive has a programmatic interface for automated retrieval of data. Tom Donaldson of the STScI gave me a great demo of the interface at the AAS meeting and sent me this very useful PDF summary and catalog of the data sets in the archive.